NOTE: This blog post deals with freewheeling diodes, not with actual TL-Smoothers. For more info on TL-Smoothers, please visit our other blog post here. There is a debate going on in the 3D printing community whether or not to use TL-Smoothers. These little modules can be added to stepper motors of 3D printers, offering recovery diodes to protect the electronic system from motor current that flows back into the system. This article discusses the use of such diodes, also known as catch diodes, flyback diodes or freewheeling diodes, and whether or not TL-Smoothers should be used in 3D printers with modern stepper drivers. The idea to add recovery diodes to chopper-controlled drivers came up decades ago, when there were early (stepper motor) drivers in bipolar technology. 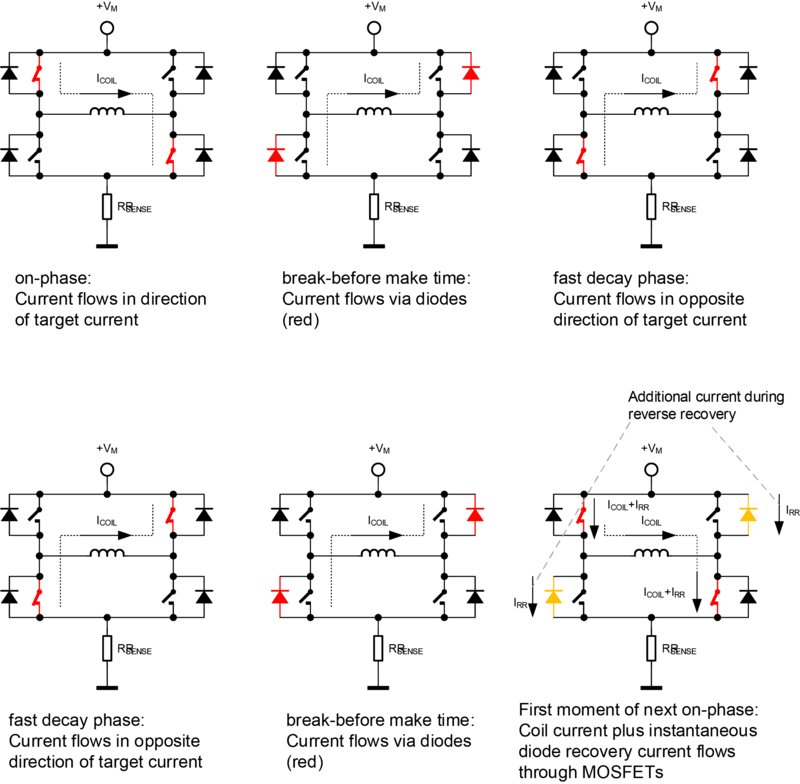 The reason is, that bipolar devices do not automatically have internal recovery diodes: Each chopper operated motor driver (half bridge) needs so-called break-before-make operation, in order to prevent a short time short circuit between high-side and low-side device. During the so-called break-before-make (BBM) time or dead-time, both high-side and low-side devices are off. However, the inductivity of the motor coil will keep current flowing and thus it needs to flow somewhere. This is where the recovery diodes are needed – either within the driver IC, or externally. With these bipolar drivers, the external diode often has been required to protect the driver IC. It will catch motor current not only during break-before-make time, but also during times of so-called fast decay, where the motor coil feeds back energy to the power supply. Modern drivers use synchronous rectification in order to relieve the diodes and to reduce power consumption in diodes. These bipolar drivers have been popular in the eighties and some of them are still on the market. The first MOSFET based stepper drivers had a high MOSFET resistance due to their costly technology. They profit from the external recovery diodes, because they catch current not only during break-before-make time but also during conduction of the MOSFETs in fast-decay mode. This eliminates part of the power dissipation, and even more important a part of the power dissipation inside the IC. Reducing power dissipation allows reaching higher overall current due to reduced heating up of the driver chip itself. Due to the required break-before-make (BBM) operation of each motor driver half-bridge, the intrinsic MOSFET bulk diodes become active for a short time with each switching event. Once the BBM time ends, the diodes have to recover, i.e. they go from a conducting to a non-conducting state. This recovery needs a few 10ns to roughly 150ns and some energy. As the recovery ends quite abruptly, it will cause high current spikes and inductive ringing in the interconnections with each switching event. The external recovery diodes typically are Schottky diodes, which offer a fast and soft recovery and low forward voltage. Their recovery behavior is much better than that of the MOSFET bulk diodes. Due to the low flow voltage of the Schottky diodes, they will prevent conduction of the MOSFET bulk diodes within the driver ICs completely, and thus eliminate the recovery energy and ringing. However, modern MOSFET drivers use improved technology which gives better recovery and also shorter, more precise BBM-times than previous older designs from the early 2000s. There also is one additional effect which is not during actual operation: Upon hot unplugging a motor, the diodes will take over inductive currents and might save the driver from destruction. The argument to reduce power dissipation still is true with actual drivers when they are operated near their limits. However, the effect is smaller and you might not even notice the few percent difference a TL-Smoother makes in 3D printers. 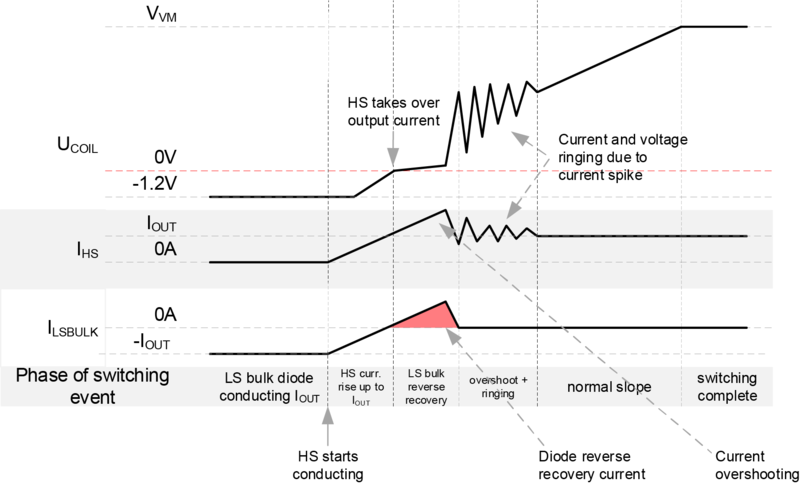 The argument to improve diode recovery should be of less importance: The reason is, that MOSFET bulk diode recovery has improved a lot with modern ICs. With a poorly designed driver IC, or poor layout, however, the current spikes caused by MOSFET driver recovery diodes could negatively influence the control part of the chip and reduce quality of the current regulation. In this case, the external diodes could also improve microstepping quality and thus printing quality. This probably is what some users see as improved printing quality with the TL-Smoothers. For Trinamic drivers, the diodes offered on TL-Smoothers are not required and will only slightly reduce power dissipation when operating at motor currents near to the driver IC limit. In fact, when using Trinamic drivers in SpreadCycle mode, it is advised not to use recovery diodes as they negatively influence the SpreadCycle current regulation. SpreadCycle measures both positive and negative current running through the sense resistor and uses this measurement to optimize chopper operation. Recovery diodes or TL-Smoothers allow part of the current to bypass the point of measurement, meaning SpreadCycle can’t measure the correct values. Due to this, the additional external Schottky diode from motor output to GND would negatively impact SpreadCycle operation. With StealthChop, however, there’s no negative effect of using additional recovery diodes as it measures different values. Summed up, TL-Smoothers will only have a minor effect on the print when using state-of-the-art stepper driver ICs, so there’s no need to use them in 3D printers with Trinamic’s chips.